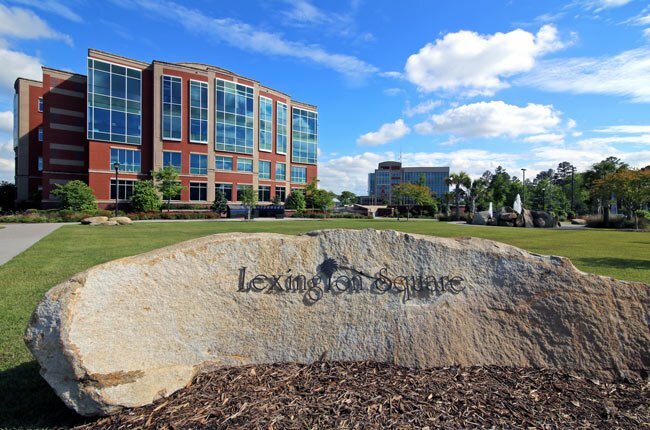 What we now know as the Town of Lexington was originally called Lexington Court House. The county, which was then a district, incorporated in 1804. It was based on the Congaree River just south of Cayce near the site of Fort Granby. Unfortunately, as settlers moved to the area and cleared land for farms, the river began to flood which in turn endangered the community. In 1818, Lexington District moved its seat to higher ground near Twelve Mile Creek. 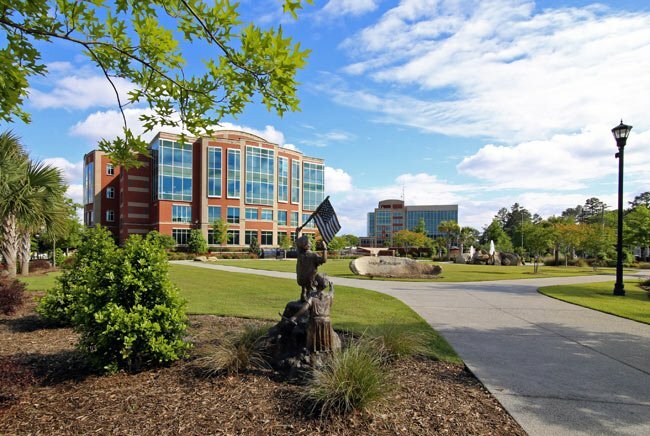 On January 24, 1820, two acres at the northwest corner of Main Street and North Lake Drive were purchased for a courthouse and jail. This wooden building, which was one of the only structures present, inspired the town’s name, which it kept until 1895. In 1838 the wooden courthouse was replaced with a granite edifice facing Twelve Mile Creek. That courthouse, which served Lexington for much of the nineteenth century, was burned by Union troops during the Civil War; its pre-1839 court records were also destroyed in the fire. In 1868 a log building was erected to serve as a courthouse until a brick one could be constructed in 1884. A modern courthouse, designed by Columbia architect J. Carroll Johnson, was erected in 1939. The 1884 courthouse was demolished during the 1950s. 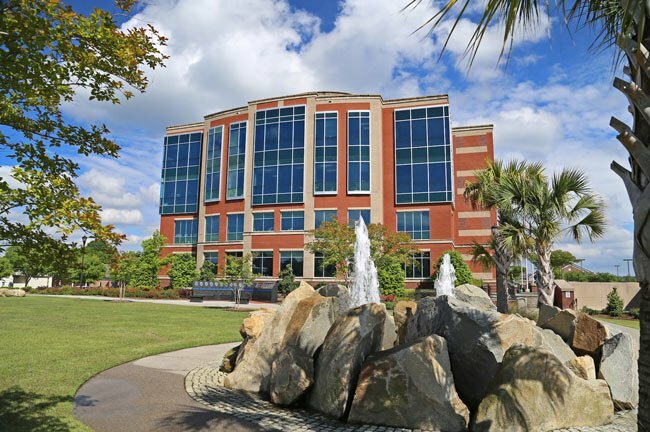 Finally, the present Lexington County courthouse was built in 2003. On April 30, 2006, the courthouse was rededicated as the Marc J. Westbrook Judicial Center to honor the late Judge Marc J. Westbrook, who helped to plan the new judicial center. Sadly, Judge Westbrook and his law clerk, Randall Davis, Jr., were killed in a car accident on September 14, 2005. A memorial fountain named in honor of both men sits on the grounds, and a red maple tree was planted in honor of Davis. On September 11, 2008, a sculpture of two pieces of aluminum from Ground Zero in New York was unveiled on the courthouse grounds in honor of fallen first responders in the September 11, 2001 attacks (seen above). 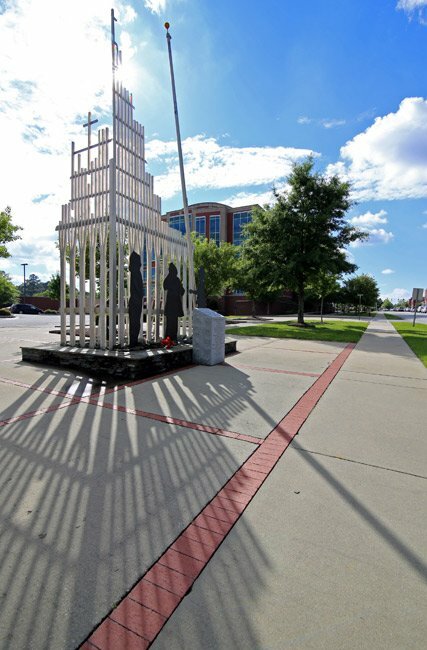 The artwork, titled “Fallen But Not Forgotten,” was designed and constructed by South Carolina native Randall Hammonds. The life-size copper firemen below the structure were created by Lexington metal artist and 2010 South Carolina State Parks Commission Artist in Residence, Mike Bell. The 1939 courthouse stands a block away from the new courthouse and continues to serve the county as the magistrate court building. Ralph, thanks for the photos and the pictures. That is a very interesting history about the buildings that have served the county over the years. 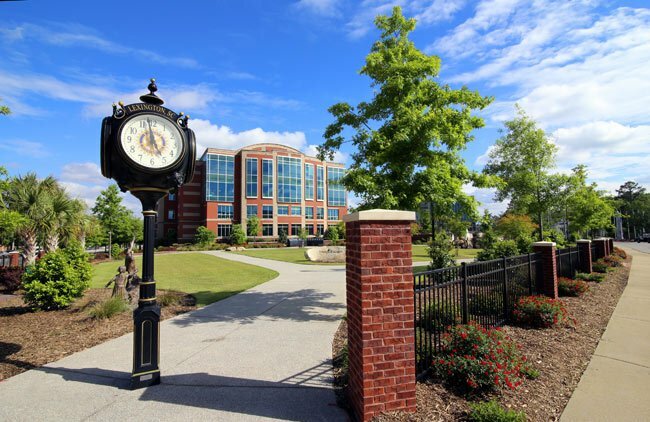 I lived in Lexington County early in my career and I remember those times pleasantly.